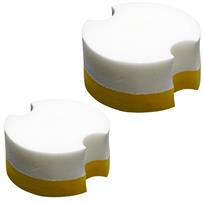 Ergonomically Designed, Hard Wearing Applicator Pads. Many wax applicator pads are thin which can lead to cramping and fatigue in the hands of the detailer. The R222 Deluxe Wax Applicator Pads are specially designed to make them comfortable to grip and easier to hold on to whilst waxing your vehicle. The clever design also facilitates "thin film application", making wax layers glide on in thin layers which cure faster, are easier to buff out and leave a more durable shine.